We decided to visit Burano in the afternoon of the last day. Rafa had already left Venice on an early morning flight, to get back to his lectures in Bath. Joanna and I took an afternoon boat out to Burano, to check out the colourful houses there. Joanna Vymeris on Fondamenta della Guidecca in Burano. For this photo we wanted to create a silhouette against the colourful houses, so we photographed Joanna doing a handstand in the shadows. Where is Wally? Joanna on Fondamenta di Cavanella. Closeup of one of the pink facades. There was a little well in one of the village squares. 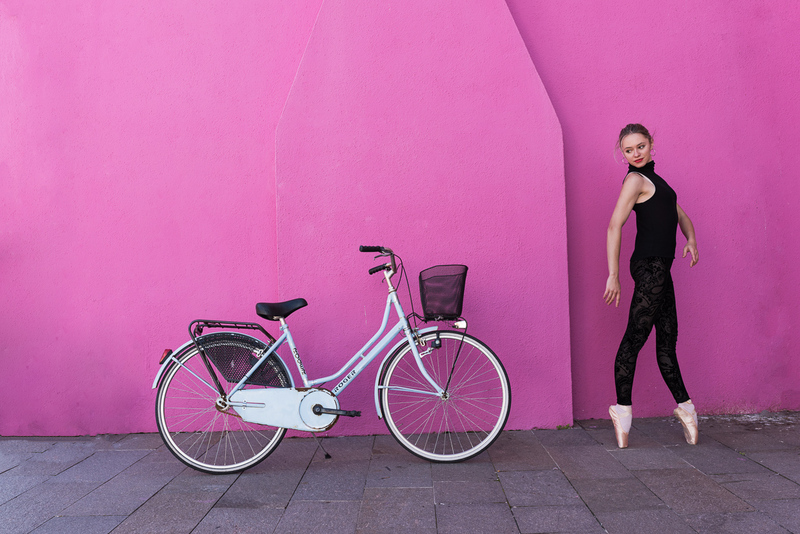 A perfect spot for an arabesque. When you see a wall like this you just have to take a photo. There was even a matching mopp and pink bucket leaning against the wall. Ending the Burano visit on point. If you want to see more photos from our Venice trip, check out the previous two blog posts: City of Bridges and Daughter of Venice. Many thanks to Joanna, Rafa and Judith!